Mac - compatible photo ID Card Designer include everything that you need to design and print stunning photo ID badges from your Mac machine. You can design different types of ID Cards including employee ID Cards, student ID Cards and visitor ID Cards with option to add photo, text, barcode and signtaure. You can create multiple ID cards with different barcode value and text using Batch Processing Series option. Software is having print setting option to print designed id cards with support to all major types of printers. You can email your designed ID Card using E-mail setting option. If you want to crop your images as per your requirements, you can use Image Cropping Tool. 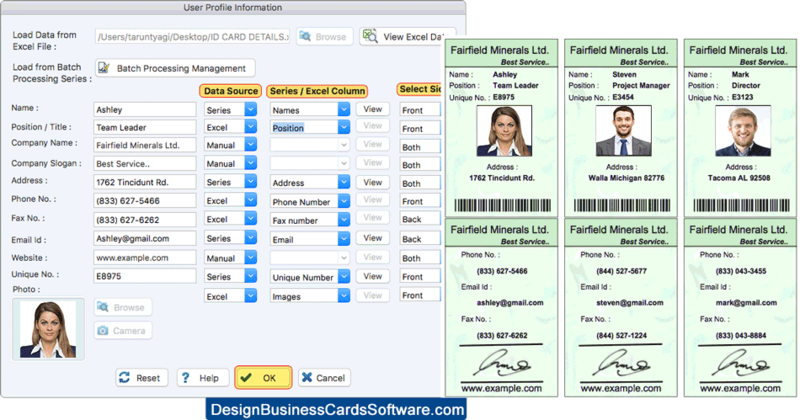 Software is having various pre-defined templates (ID Card Design) to quickly create id cards. 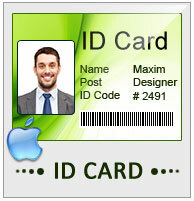 You can export designed id card as template, as image, and as PDF file format on Mac machine. Camera setting option to capture image of user and add on your ID cards.